Byron @ Clarkes, Unit 3 is a well appointed one bedroom Byron Bay apartment, located in a quiet area adjacent to Arakwal National Park and only a short stroll to Clarkes Beach and the heart of Byron. 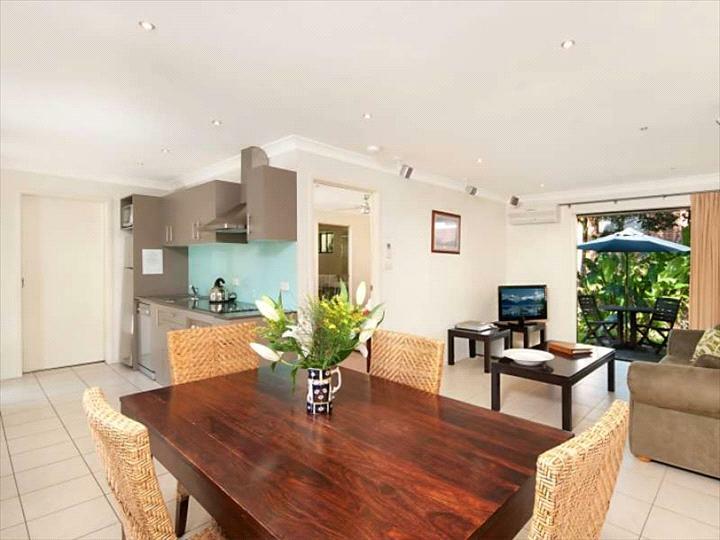 Byron @ Clarkes, Unit 3 is situated in a small ground floor complex with landscaped tropical gardens, giving a cool inviting atmosphere for your next Byron Bay holiday. Clarkes Beach is situated an easy 10 minute walk to Byron’s town centre and the relaxed shopping and restaurant precinct of Byron Bay. You can take a leisurely walk along the sand, only minutes from your holiday accommodation, or choose the picturesque path that runs along Lawson Street, adjacent to the popular Main Beach. The Pass at Clarkes, provides a world famous surfing experience. Byron @ Clarkes is only a 3 minute walk to Clarkes Beach and 10 minute walk to town. Sorry but the majority of guests must be over 21 years of age. Please note rates displayed do not apply to Schoolies bookings please enquire. Just a quick note to say we loved staying at Byron@Clarke’s. The place was very comfortable and the outdoor setting just made the place.